Zoolander 2, like many a garbage sequel, was destined to spiral into the abyss of bad movies whose reviews are much more entertaining than the movie itself, the type that allows critics to bathe in the pettiest of metaphors. Depending on the role, the camera angle, the costume, and the hair and makeup, Mr. Stiller, 50, swings between polarities of trollishness and desirability. In some movies, he appears dwarfish and deformed with a head that’s too big for his body and empty space-alien eyes. He is of average height but looks shorter. And when bulked up, he appears hunched and musclebound. But when he fixes those baby blues on the camera and thrusts out his jaw to accentuate his cheekbones, he can pass as handsome: just barely. The tepid satire is undercut by cameo appearances by fashion giants like Valentino, Marc Jacobs, Anna Wintour and Tommy Hilfiger. Because they are in on the joke, their very presence robs the movie of any remaining edge. 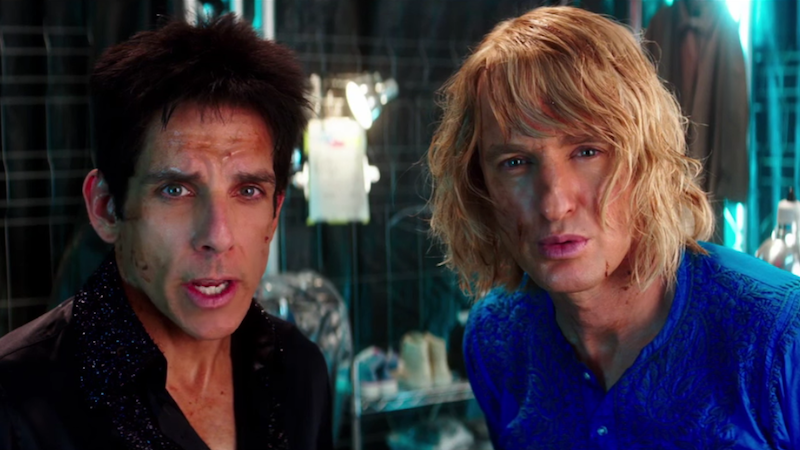 Really, the dumb thing about “Zoolander 2” is that it isn’t nearly dumb enough: Rather than coasting along on a stream of blissful comic idiocy, it cobbles together a busy skein of twists and complications, as if the mental strain of following along might distract us from how crushingly unfunny it is. The bigger issue, however, is that not one of the patchy sequel’s threads really holds together, even within the elastic boundaries of farce. ...it’s been so long since we first met Stiller and Owen Wilson’s dim-and-dimmer narcissists Derek and Hansel that a sequel—or at least this sequel—feels sad and desperate, like a comic who doesn’t know when to get off stage. The flop sweat drips from the opening scene, where a labored Justin Bieber gag barely elicits a chuckle but provides the film with its lazy plot trigger: Who’s killing the world’s biggest pop stars? It’s all downhill from there as Stiller and co-writers Justin Theroux, John Hamburg, and Nicholas Stoller flail at the lowest-hanging pop culture fruit. ...Zoolander 2 represents the worst-case scenario. Not because Zoolander 2 is the worst movie ever made — it isn’t — but because it’s what we fear every time one of these projects gets announced: a joyless cash-grab more interested in rehashing old ideas than building on them. The paper thin plot feels rushed and harried, because it stops every two minutes to make room for random notable names to mug for the camera. To make all of these cameos that much worse, each celebrity says or does something that refers to their career or notoriety, aggressively wink-wink, nudge-nudging any potential humor into oblivion. Unfortunately, when it comes to intellect and wit, Zoolander No. 2 doesn’t have a pair of functioning brain cells to rub together. But eventually you’ll start to feel like your smile is sort of freezing on your face (Botox or no Botox); in your heart, you’ve just stopped laughing.